Scott Lesovic has a job many people would envy: bringing the wonder of magic to children and adults. Scott’s a professional magician and an ambulance attendant. He asked me to review his magician’s autobiography to make sure it presents him in the best light. Let’s start by taking a look at Scott’s current bio. When you experience magic every day, where do you go from there? Magician Scott Lesovic knows…you take others along for a magical ride. Imagine being 4 years old, seeing a magician perform miracles on TV, and making a life decision that Magic was to be your chosen career path. Sound impossible? Well not for professional magician Scott Lesovic. Scott first got bit with the magic bug at the age of 4, while watching David Copperfield perform on one of his national TV specials. Inspired by what he saw, the young Scott attempted to duplicate Copperfield’s trick showing everyone he came in contact with, whether he knew them or not. This was Scott’s taste of being in the spot light. Furthering his interest in the art of prestidigitation, Scott’s parents, Edward & Rose Marie, bought him, his first magic set at the age of five. Overwhelmed, by how much magic was in one little box, Scott DOVE IN head first and thus began the pursuit of a career in conjuring. By age 7 – he was now performing in front of audiences of friends & family as well as his fellow scout members – something that Scott would also develop into a passion, his love for outdoors and scouting. Off in the woods, Scott honed his magic performing for the scouts and leaders at Heritage Reservation, a Boy Scout camp. As part of the camp staff, he used his magical talents not only to purely entertain, but also calm homesick scouts and convince them to stay on for the week. Scott stretched his show building skills by making magic to fit the different themes that rotated through the camp each year. He performed as Merlin the Wizard from King Arthur’s Court, snake oil salesman from the Wild West. During the 9 years working at the camp, Scott grew not only in magic, but teaching, business, and first aid. Somewhere in that mix, he found the time to continue on his own scouting career and earned the rank of Eagle Scout, something only 2% of all Boy Scouts ever achieve. Imagine being four years old, seeing a magician perform miracles on TV, and deciding right then and there that magic was to be your chosen career path. Sound impossible? Well, not for professional magician Scott Lesovic. Scott was so taken with magic that he immediately started trying to duplicate the tricks he had seen. He insisted on performing magic tricks for everyone he encountered – whether he knew them or not! When it became apparent that this was no passing fancy, Scott’s parents bought him his first magic set at the age of five. Overwhelmed, by how much magic was in one little box, Scott dove in head first and has never looked back. By age seven Scott had combined his love of magic with his other love – the outdoors and scouting. Off in the woods, Scott honed his entertaining skills performing for the scouts and leaders at Heritage Reservation Boy Scout camp. 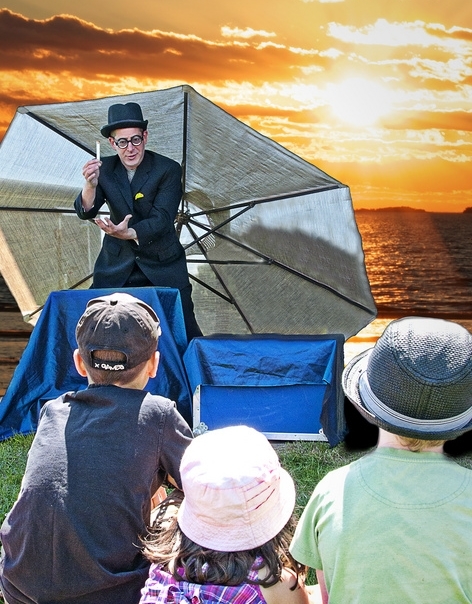 As part of the camp staff, he used his magic talents not only to entertain, but also to calm homesick children and persuade them to stay on for the week. As a camp leader, Scott stretched his show building skills by making magic to fit the different themes that rotated through the camp each year. He performed as Merlin the Wizard from King Arthur’s Court, a snake oil salesman from the Wild West, and _______________ (note to Scott: add one more theme example). During his nine years working at Boy Scout camp, Scott grew not only in magic, but also in teaching, business, and first aid. Somewhere in that mix, he found the time to continue his own scouting career and earned the rank of Eagle Scout, something only 2% of all Boy Scouts ever achieve. During the winter months, Scott works as an ambulance attendant. Although “magician” and “ambulance attendant” may sound like a strange combination of careers, in fact it is a perfect match for Scott’s background. He uses his magic and showmanship to calm scared children and adults during emergency situations, all the while doing every physical thing possible to care for that person. Contact Magician Scott Lesovic at __________. Scott’s original autobiography had lots of great material for me to work with. All that was needed was some editing and polishing. Although I liked the opening two sentences that started “When you experience magic every day…”, I thought they sounded more like a tagline than part of a biography. I could see those two sentences being used very effectively as a sidebar call-out or in the header of Scott’s website. The only thing that I think is missing from Scott’s bio is a sense of what he can do for the customer. His bio tells me an engaging story about him, but doesn’t tell me what he can do for me. Is he available for parties? Does he teach magic classes? I’d like to know a bit more about that.